Based on the 2nd Quarter 2019 CIRT Sentiment Index Report, the overall outlook for members remained constant, with the latest figures showing only a slight increase in the CIRT Sentiment Index vs. a marginal decrease in the Design Index when compared with the first quarter. [The CIRT Sentiment Index rose from 64.8 to 65.0, and the Design Index fell from 70.8 to 70.1]. The report’s current trends questions focused on: (1) topics that would be most valuable for research studies; and (2) effects of tariffs on CIRT firms, including: strategies used to combat such effects and how tariffs have changed the costs and availability of supplies. (See the full report for details). The U.S. Census Bureau report, delayed due to the federal government shutdown, had good news related to construction put in place for January 2019 estimated at a seasonally adjusted annual rate of $1,307.3 billion, 3.5 percent above the revised December estimate of $1,263.1 billion. Most of the bounce in the new year came in public sector spending which moved-up nearly 5.0 percent with sizable gains in highway construction. The January figure is 2.4 percent above the January 2018 estimate of $1,276.3 billion. The U.S. Census Bureau announced the value put in place of construction for the year 2018 was $1,297.7 billion, 4.1 percent above the $1,246.0 billion spent in 2017. 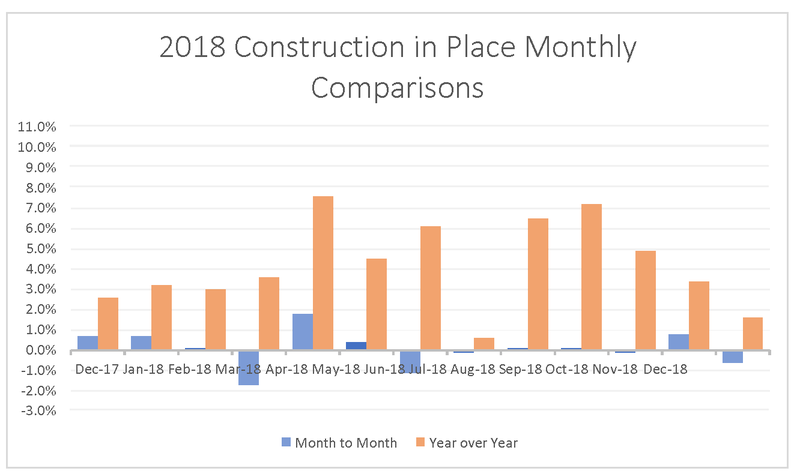 In December construction spending was estimated at a seasonally adjusted annual rate of $1,292.7 billion, 0.6 percent below the revised November estimate of $1,300.6 billion. However, the December figure is 1.6 percent above the December 2017 estimate of $1,272.6 billion. CIRT’s Sentiment Index Report for the 1st Quarter of 2019 showed a drop from 66.3 to 64.8 overall, with the subset Design Index falling from 73.4 to 70.8. Both indexes saw a steady downward trend all throughout 2018, with that trend now continuing into 2019. Also included in the report, members were asked about their hiring prospects for this year and what they expect to be the biggest challenges for their businesses in 2019. [To read the full 1stQtr 2019 Report and details go HERE].